Building upon a trusted 30 year foundation left by the retirement of Mr. John Heckman and the closing of Sew Simple, Inc., Amy and Eric Johnson formed Sew Simple of Lynchburg LLC to continue serving the sewing, quilting, and embroidery needs of south-central Virginia and beyond. You may have seen Amy in the shop over the last 3 years working with Mr. Heckman. She’s also a popular quilting blogger, online quilting instructor, and has two classes available with Craftsy.com where she teaches free motion quilting with rulers on domestic sewing machines or sit-down style long arm machines. While Amy is passionate about free motion quilting, she’s also an experienced sewer of all kinds and has also begun doing machine embroidery. She’s been having fun lately with incorporating embroidery and digitally cut fabric into her projects. Whether it’s making dresses for her daughter, curtains or other things for the home, or quilts, she is a knowledgeable resource and an enthusiastic encourager of all things creative with needle and thread. Eric is a life-long “fixer” of all things mechanical and electronic. He has found that the nearly endless variety of sewing machines (and their operators!) gives him the diversity he loves to keep his work interesting. 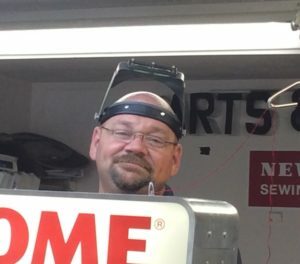 Beginning in late 2013 under Mr. Heckman’s teaching, then Janome Service Training Certification on the top-of-the-line Memory Craft 15000, and a course of training with a long-time sewing machine repairman in North Carolina, he now does all of the repairs and service on the machines brought into Sew Simple. We continue to sell new, high quality, feature rich and reliable Janome machines as well as repair and service nearly all makes and models of sewing, serging, and embroidery machines. Equipping our customers with the machines, accessories, and supplies they need is important to us, but even more, we strive to educate and inspire our customers to succeed in their creative stitching projects whether utilitarian, fancy, or anywhere in between. You can find us in the shop of course, but you can also find us online on Facebook, at Amy’s Free Motion Quilting Adventures, at our online shop Amy’s Quilting Adventures where we sell the tools Amy uses in her Craftsy classes as well as some of her favorite supplies, and Amy also posts on Pinterest and Instagram.